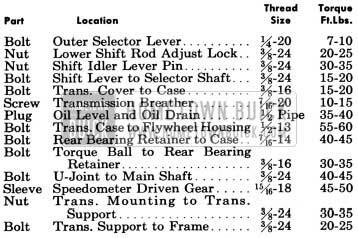 NOTE: Where dimensions and limits for fit of parts are given in these specifications they apply to new parts only. Where limits are given, “T” means tight and “L” means loose. 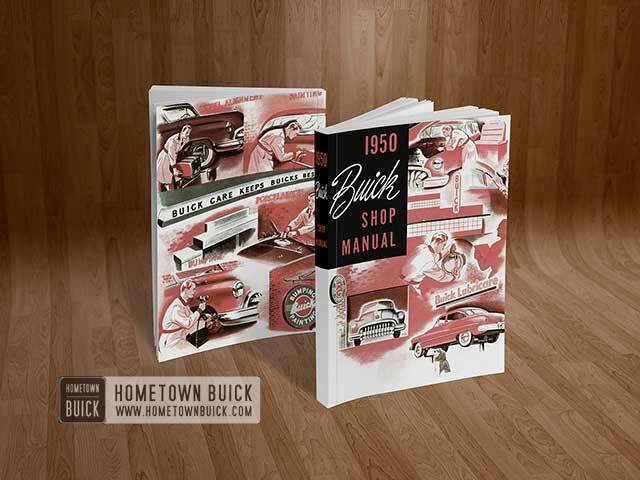 The 1950 Buick Synchromesh transmission is standard equipment and Dynaflow Drive is available as optional equipment on Series 40-50. 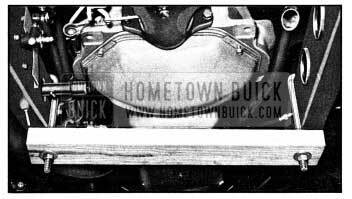 On Series 70, Dynaflow Drive is standard equipment and the 1950 Buick Synchromesh transmission is not available. 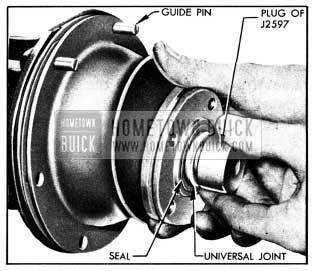 The 1950 Buick Synchromesh transmission is solidly bolted to the rear face of flywheel upper housing, with a heavy paper gasket between, to form a unit assembly with the engine. The transmission main drive gear extends through the clutch driven plate into a single-row-ball pilot bearing seated in the rear end of engine crankshaft. The outer race of main drive gear bearing projects from transmission case to seat in a counterbore in flywheel housing, thus serving as a pilot to center the transmission with engine crankshaft. The transmission, as well as rear end of engine, is carried on a channel-shaped support or cross member which is bolted to the frame “X” member. The transmission is cushioned on a rubber mounting pad which is bolted to the rear bearing retainer and to the top of transmission support. 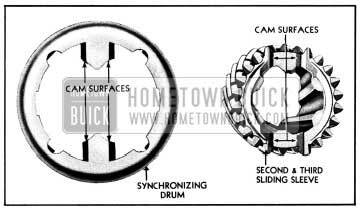 Driving thrust is taken by a rubber thrust pad located between the rear flange of transmission support and a thrust plate attached to rear bearing retainer by the torque ball retainer bolts. Shims, as required, are placed between the transmission support and the thrust pad to fill any fore and aft space existing at this point when engine and transmission mounting pads are in normal position. See figure 4-28. 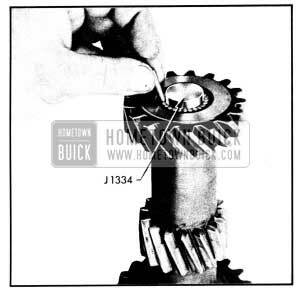 The 1950 Buick Synchromesh transmission main drive gear is supported by a ball bearing seated in front wall of transmission case. 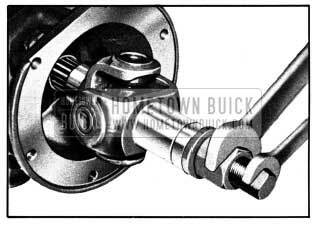 The ball bearing, which is shielded on rearward side, is pressed against a shoulder on main drive gear and held in place by an oil slinger, washer. and retainer (snap ring). The outer race of bearing is grooved for a snap ring which fits between transmission case and flywheel housing to hold bearing and main drive gear in place. See figure 4-13. 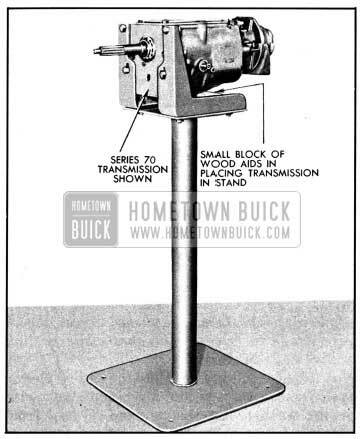 The 1950 Buick Synchromesh transmission counter gear is supported by two roller bearings on a shaft which is held stationary in transmission case by a steel ball seated in recesses in case and rear end of shaft. A tubular spacer and two thrust washers are located between the roller bearings, and a retaining washer is located at outer end of each bearing to hold the rollers in position. End thrust is taken by a bronze thrust washer at each end of counter gear. A hole in hub of counter gear permits lubricant to reach bearings and thrust washers. 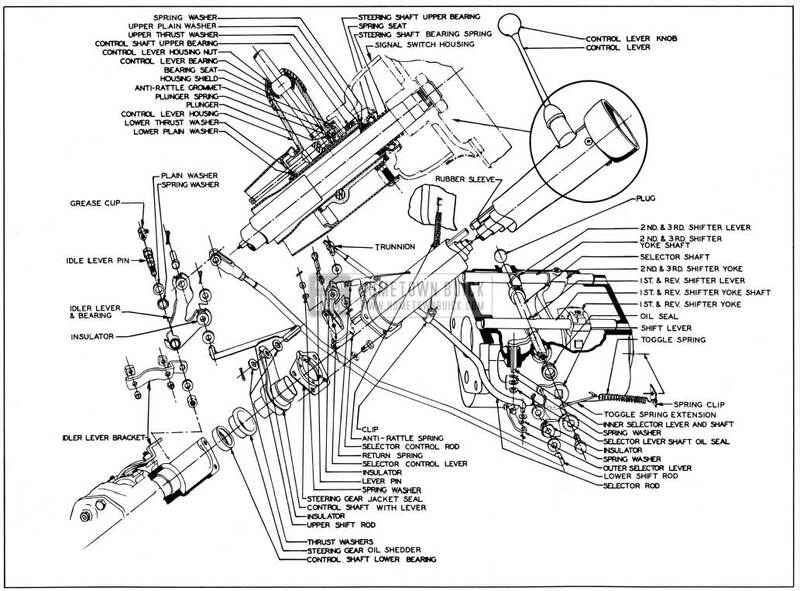 See figure 4-13.
sleeve carries the first and reverse sliding gear on splines so that it also transmits drive to the main shaft in first speed and reverse. See figure 4-13. 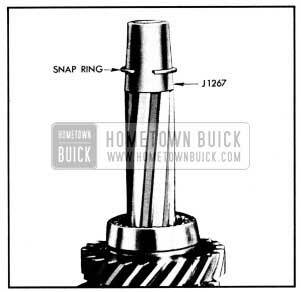 The universal joint, torque ball, and speedometer drive gears are automatically lubricated from the transmission. 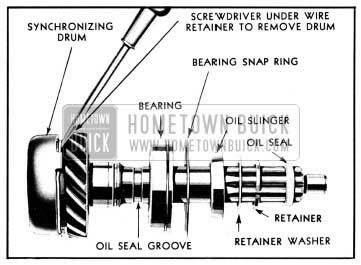 Oil enters the rear bearing :retainer through a hole at the top and returns to transmission through a hole at bottom of retainer. A synthetic rubber boot extends from the outer retainer to the flange of torque ball to provide an external oil seal and an oil seal installed in torque ball at rear end of bronze bushing prevents leakage of oil between transmission and torque tube. A breather or air vent is installed in upper side of the rear bearing retainer to prevent a buildup of pressure, due to heat, that would force transmission lubricant out past gaskets and oil seals. See figure 4-13. The lower end of control shaft is reduced in diameter and is supported by a metal and fabric bearing seated in the steering gear housing. An oil shedder is pressed into steering gear housing over the bearing and the shedder is covered by a cup welded to the control shaft, to form a s al against entrance of dirt and water. A lever welded to control shaft is connected by a short upper shift rod to the idler lever mounted on a bracket attached to steering gear housing. The idler lever is bushed and carried on a shouldered pin attached to bracket by a nut and washer. The pin is drilled and ‘fitted with a grease fitting for lubrication. 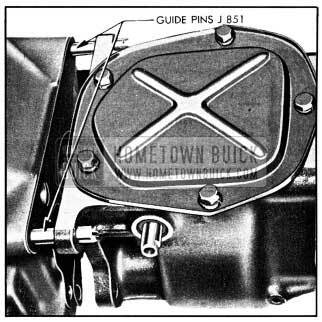 A long lower shift rod, provided with an adjustable clevis, connects the idler lever to the shift lever on selector shaft in transmission. Rubber insulators seated in the levers prevent noise at the connection with both ends of both shift rods. See figure 4-18. Hard shifting may be caused either by conditions in shift control mechanism in-steering column or by conditions in transmission assembly. 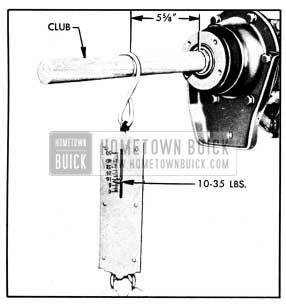 Disconnect lower shift rod at idler lever to determine which unit is at fault. If gear clash continues after allowing proper time for clutch driven plate to stop, check clutch pedal lash and adjust to specified limits. See paragraph 4-4. In exceptional cases of driven plate spinning, clutch pedal lash should be maintained at 1/2″. Make sure that idle speed of engine when hot is 450 RPM. A faster idle aggravates driven plate spinning. Conditions within the transmission which may cause gear clash are: ( 1) Faulty synchronizing drums or cone surfaces; (2) Excessive main shaft end play. Gear clash also may be caused by a dragging clutch plate. See paragraph 4-3 (d). Improperly calibrated clutch driven plate, faulty crankshaft balancer, or scored rear axle gears may cause rattle in transmission in third speed, on acceleration. Rattles occuring on wide open throttle between 40 and 60 MPH are usually caused by improper clutch driven plate dampening; a new driven plate should be installed if rattles are objectionable. Gear teeth will be seriously damaged and possibly broken, by failure of car operator to fully engage gears on every shift before engaging clutch and applying engine power. 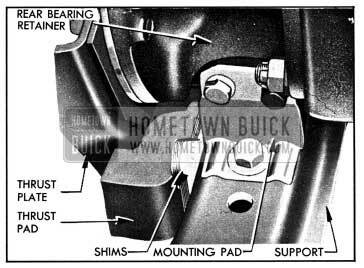 The gear shift control lever, bearing, and bearing seat may be removed by unscrewing the control lever housing nut. Unscrew knob from lever to remove housing nut. A rubber anti-rattle grommet fits into a groove in the inner end of control lever. When installing a new bearing on control lever, the large diameter of bearing must be toward the lever knob. Before installing control lever, coat inner end and socket in selector red with Lubriplate. During installation of lever be careful to draw housing nut tight so that shoulder in nut will seat against flange of bearing seat and lock the seat in place. 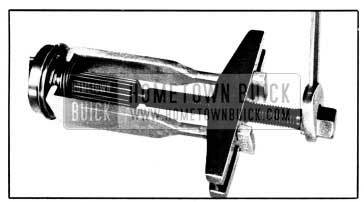 Prepare two 3/8″ headless guide pins 1 3/8″ long, having 3/8″-16 threads 1/2″ long and screwdriver slots cut in opposite end. Install guide pins in upper bolt holes in rear bearing retainer . flange. See figure 4-22. Disconnect speedometer cable, lower shift rod, and lower selector rod. Remove toggle spring and extension, remove shift lever and lock washer from selector shaft and remove outer selector lever, to provide clearance for removing. transmission to flywheel housing bolts. Hold shift lever in neutral while removing attaching bolt, to avoid damaging shifter lever on shaft inside transmission. Remove the two top transmission to flywheel housing bolts and install Guide Pins J851 to support transmission. See figure 4-27. 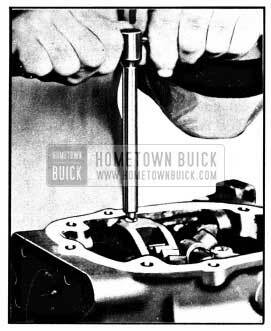 Remove lower bolts, then move transmission straight back and lower to floor. CAUTION: If guide pins are not used and weight of transmission is allowed to rest on main drive gear in clutch driven plate hub, the driven plate will be damaged. 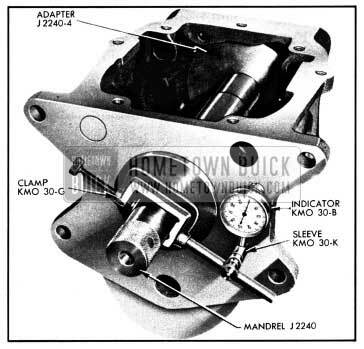 Connect lower shift rod and selector rod to their levers and check adjustment as described in paragraph 4-11. 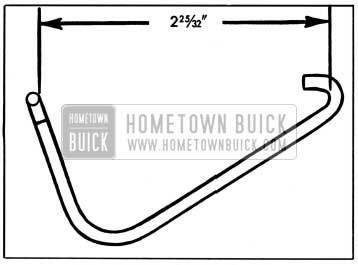 Place 7/8 pint of transmission lubricant in transmission. 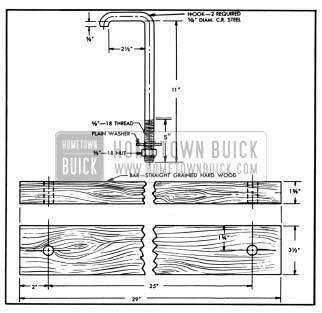 In addition, inject 1/2 pint of transmission lubricant through universal joint yoke. See paragraph 1-1 for specified lubricant. Road test car and check transmission for a. Proper shifting into all speeds. Remove the four set screws from shifter levers and shifter yokes, using Remover J 2895. See figure 4-30. 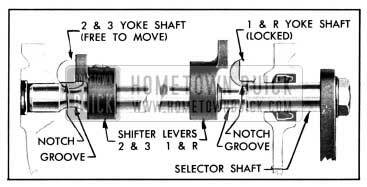 Drive selector shaft out through right side of transmission case, using babbit hammer. Welsh plug in right side of case will be driven out by shaft. Do not let shifter levers drop into case. Remove shifter yokes and shafts by pushing shafts out through front of transmission case, using care to prevent poppet balls from jumping out. The welsh plug in front end of case will be driven out by the second and third shifter yoke shaft. Remove poppet balls and springs. NOTE: If poppet balls and springs are not to be replaced the shafts may be pushed to rear of case far enough to release the yokes while holding poppet balls in place. Remove sliding gear and the sliding sleeve, then remove the selector lever arid shaft with spring washer, flat washer, and oil seal from transmission case. Remove speedometer worm gear, spacer, bearing and thrust washer from main shaft, using Puller Jl134-H to remove worm gear and bearing. See figure 4-33. Gears and Shafts. Carefully inspect teeth and other ground surfaces of all gears for wear, scoring, pitting, chips, nicks, and burrs. Do not confuse manufacturing cutter marks with scores or pits. Conical surfaces of gears where contacted by synchronizing drums must be smooth and free of burrs. Slight scores or burrs may be honed off with a fine stone, however, if any gear is chipped or excessively worn it should be replaced. Universal Joint. Inspect universal joint for wear in bearings and for fit on main shaft and propeller shaft, and in torque ball bushing. 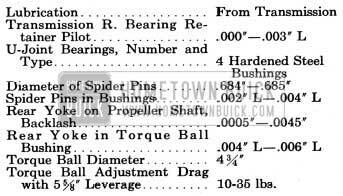 Allowable play of spider pins in bushings is .002″ to .004″. 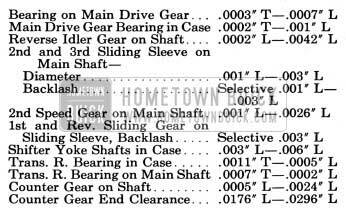 Allowable backlash of rear yoke on propeller shaft splines is .0005″ to .0045″. The front yoke must be a tight fit, rotatively, on main shaft to prevent “snap” when alternating car movement between forward and reverse. 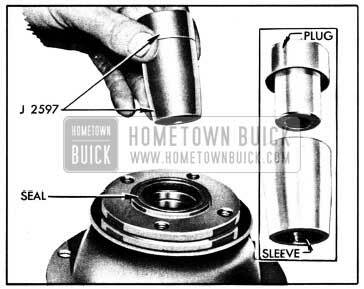 The rear yoke of universal joint and bushing in torque ball must be free of scores and not worn excessively; clearance between these parts should be .004″ to .006″. Torque Ball. If torque ball and retainers are scored or pitted on bearing surfaces they should be replaced. Replace torque ball boot if worn or damaged. Replace oil seal in torque ball if it is worn. When installing a new seal, place it in position with the feather edge pointing into torque ball, then press seal squarely into place, using a flat piece of metal to avoid distorting seal. Press new seal flush with boss on flange of torque ball. NOTE: Oil seal should be stored in neatsfoot oil to keep leather soft and pliable. Do not use seal ha!1Jing a hard, dry leather. Transmission Mounting and Thrust Pad. 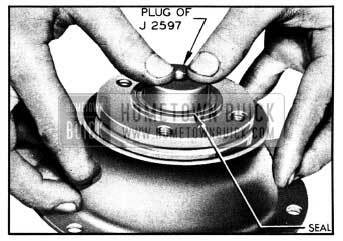 Inspect mounting and thrust pads. 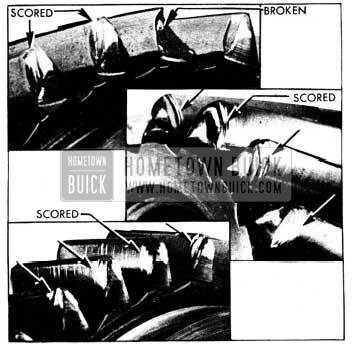 Replace either part if rubber is broken or deteriorated. 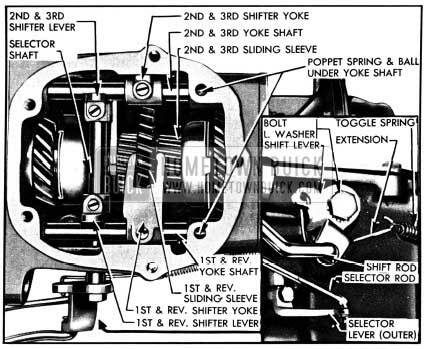 Transmission Case. 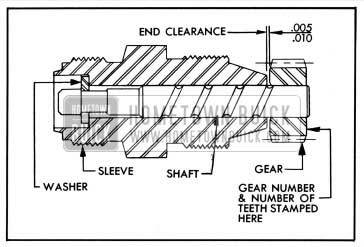 Inspect selector shaft oil seal in case. If worn, or there was evidence of oil leakage past the seal, remove it and install a new one. Coat outer surface of seal with white lead or other sealing compound and install seal with feather edge pointing inward. Assemble the transmission by reversing the sequence of steps given for disassembly. In addition, observe the following instructions that apply to assembly. Condition of Parts. Make certain that all parts are absolutely clean and that gears and synchronizing drums are free of nicks or burrs. Use all new gaskets and oil seals or packings to insure against leakage of lubricants. Use all new snap rings, and retainers of snap ring type. Snap rings are frequently distorted during removal and are difficult to true up satisfactorily for further service. Selector Lever and Shaft, Washers and Oil Seal. 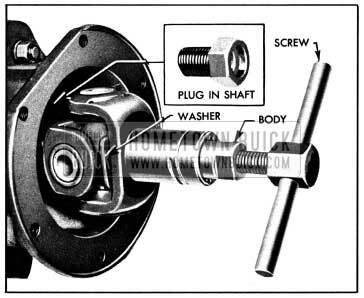 Place spring washer, fiat washer, and oil seal on shaft in the order named, with crowned side of spring washer against the fiat washer. Apply Lubriplate to shaft before installation of assembled parts in transmission case.